CHECK OUT THE NEW HOOSIER SCHOOL HEIST APPAREL PAGE FOR GREAT T-SHIRTS!!!! 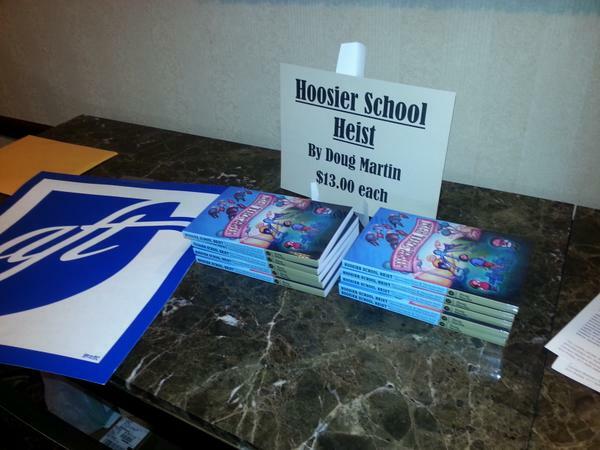 This is Doug Martin’s Hoosier School Heist blog, where I will be updating everyone on my book tour across Indiana, giving advice on how to expose the billionaires behind the assault on our public schools, posting book events, and handing over other important information. I am still blogging at Schools Matter, and I will be cross-posting some new articles here. So stay tuned. But I want to use this blog more for keeping everyone up to date on the book, the upcoming elections, and Hoosier School Heist’s social media campaign. I am constantly updating Hoosier School Heist on Facebook, on Twitter, on Pinterest, on Flipboard (this site is really cool! ), and on the Hoosier School Heist TV YouTube channel (very cool!). PayPal buyers can order Hoosier School Heist directly here or click on the very top link in the left sidebar of this Hoosier School Heist blog.. If you want to order the book by check or money order, please visit this page where you can find my email address (from which I will respond promptly), as well as links to other blogs I have written for in the past, along with my Indiana Government Exposed Facebook page. In the top left corner of this website, you will find the page “Blog” listed. This link will take you to a page which holds every single blog entry I have composed on this site. If you are interested in recent posts, merely scroll down further and you will find title and listed to them. Continuing down the left bar of this site’s main page, you come across “Categories.” “Doug Martin Blogs” is the link to find all of my new articles, journal entries on my travels, reflections, photographs, and other tidbits of information. It will be my active blog page. If you want to keep up with me on various social media sites where I offer viewers unique things, go to the “Follow Hoosier School Heist on Social Media” link. Here I have links to all my social media pages, some of which you can also find toward the bottom of the left sidebar on this website. The “Hype” category leads you to a page where people say wonderful things about Hoosier School Heist and I give you an update on the counties where you can find people reading the book, etc. The rest of the left sidebar material is pretty self-explanatory, so there is no need for detail. Thank you for being here. Please visit again in the future for more updates as we get this blog started.